Solidification: Imparts physical/dimensional stability to contain contaminants in a solid product and reduce access by external agents (e.g., air, rainfall). Stabilisation: Chemical reactions are induced between the stabilising agent and contaminants to produce more chemically stable constituents. Following treatment, no mass reduction in contamination occurs but reduced mobility and therefore mass flux to receptors effectively removes the contaminant pathway. Some additives such as Portland cement utilise both stabilisation and solidification processes to reduce the mobility of contaminants. In the case of Portland cement, calcium silicates and aluminates within the cement react with water to form calcium aluminate and calcium silicate hydrates. These in turn can react with some metals to form cement-metal hydration products which are bound even at low pH concentrations unlike many metal-hydroxides compounds. Leachability testing of the S/S material is usually undertaken to demonstrate the success of the encapsulation/immobilisation of contaminants. 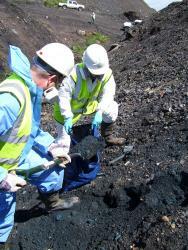 Before site works can begin, contaminated soil samples are taken and laboratory and pilot scale tests to calculate the best type, combination and percentage of binder required are conducted, in line with Environment Agency guidance. Generally the percentage binder required for successful S/S is between 5% and 20% wt/wt. Once on site stabilisation and solidification can be implemented utilising either in-situ or ex-situ techniques. This method utilises a hollow stem auger and drill rig to mix and inject binders directly into the contaminated zone. A vapour extraction hood and treatment system around the drilling rig head may be required depending on the contaminants/binder and potential for VOC production from the binder contaminant reaction. 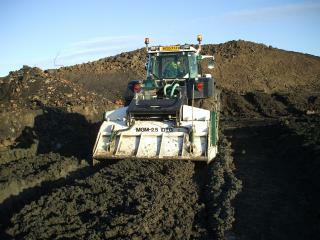 Contaminated soils are excavated and classified and undergo soil processing. Then the contaminated soil is mixed with the binders using high shear/cement slurry/pug mixers, or specialised excavators. Materials are then replaced in the ground and compacted. VertaseFLI has conducted a number of S/S projects and pilot trails including S/S of cyanide and mercury contaminated soils. As part of a remediation strategy by VertaseFLI, stabilisation/solidification of soils containing leachable mercury above site specific criteria was conducted. VertaseFLI undertook comprehensive research and development in our in-house S/S laboratory, and a suitable mix design was developed. This mix design was successfully demonstrated with on-site pilot scale trials. VertaseFLI utilised excavators with specialist mixing buckets to apply and mix the S/S treatment binder with the mercury impacted material, and circa. 12,000m3 of mercury contaminated material was successfully remediated. Regular spot samples of treated material were recovered, allowed to cure and then subjected to stringent validation testing. All 12,000m3 was validated and reused on site.